The best offense is a GREAT defense. Effective data management involves a synergy of software and hardware tools, device management and most of all, a well-informed and acutely aware team, who will maximize your tools’ efficiency and effectiveness. We truly understand that your network is only as strong as the team member who will click a phishing email or an infected website. Our team will work with your team to be keenly aware and vigilant of threats. It is not a question whether your organization will be breached or attacked but when. Are you ready? We understand you have unlimited choices when it comes to security partners. Our partners offer comprehensive tools and solutions that work cohesively in a layered approach to safeguard your organization’s data. Our mission is simple – we help you focus on what you do best by providing the tools, training and support to keep your data and network accessible, stable, and safeguarded. Our vision for our clients is 100% continuous, compliant uptime with all threats managed and contained. Our team truly cares about what you want and what works best for your organization. We’re continually striving to learn, test, incorporate and implement the best solutions for you. 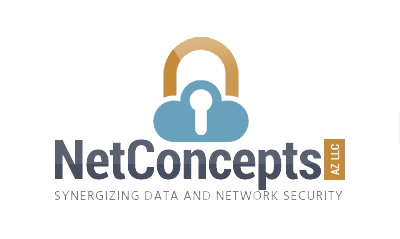 Keep up with NET CONCEPTS AZ and get instant news occasionally. Absolutely no spam or similar emails, just noteworthy news and information.